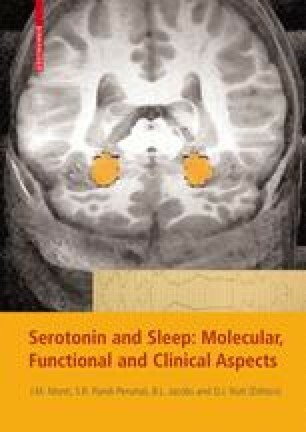 This chapter reviews the role of the different serotonin receptors located in the circadian apparatus and their possible clinical implications for the activity of antidepressants. The central oscillator located in the hypothalamic suprachiasmatic nuclei (SCN) received three major inputs: (a) the retinohypothalamic tract, which extends from the retina and releases glutamate and pituitary adenylate cyclase-activating polypeptide at its nerve endings; (b) the geniculohypothalamic tract, which originates in the retino-recipient area of the intergeniculate leaflet (IGL) and releases neuropeptide Y and Γ-aminobutyric acid as transmitters; (c) a dense serotonergic innervation arising from ascending projections of serotonin neurons in midbrain raphe nuclei. Serotonergic projections come directly from the median raphe nucleus and indirectly from the dorsal raphe nucleus via the IGL. Destruction of serotonergic afferents to the SCN modifies circadian behavioral responses to light. At the SCN several serotonin receptors are localized (i.e., 5-HT1A, 5-HT1B, 5-HT2A, 5-HT2C, 5-HT5A and 5-HT7 receptor subtypes). Basic and clinical data on the efficacy of agomelatine, a novel antidepressant that combines a potent agonist activity of melatonin MT1 and MT2 receptors and an antagonist activity of 5-HT2C receptors, are reviewed.